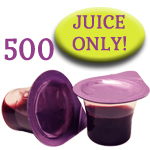 Prefilled Communion cups are creatively packaged "all in one" sets of juice with wafers, ready to serve! Both elements of Communion are individually sealed in one easy-open cup. Prepackaged Communion cups with bread-wafer sets are a fresh way to make celebrating the Lord's Supper healthier and more convenient. Portable Communion supplies can be taken anywhere and used for church gatherings, visitations, prison ministries and community outreach programs. 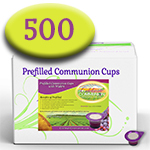 Available with or without wafers, prefilled Communion cups have extended shelf life & no refrigeration needed. Try a FREE SAMPLE!!! 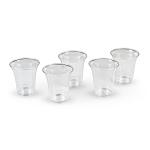 Both elements of Communion are individually sealed in one easy-open cup. Prepackaged Communion cups with bread-wafer sets are a fresh way to make celebrating the Lord's Supper healthier and more convenient. Get a free prefilled sample! From Lori Ralls, Brand & Customer Experience Manager: I love sharing in the joy of Communion! It’s an honor to provide these excellent resources for your ministry to wholeheartedly focus on the love of the Lord. Let me serve you with the freshest supplies. I’ll keep you updated on the latest advances in innovative products. We're here to help you prepare and serve your congregation a meaningful Communion celebration. Our focus is to provide quality supplies, superior freshness and exceptional customer service. Everything is delivered right to your door. We're excited to be the only online store that guarantees the freshness of our product by standing behind a freshness date we disclose to you. Questions? You can reach us at 877-222-0771 Monday-Thursday, 8:00-5:00 PM Pacific Time Zone. We are closed on Friday. Bless you! 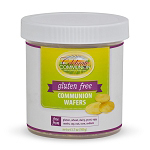 Celebrate Communion offers a complete line of supplies for your ministry: disposable Communion cups, altar breads, serving trays, specialty gluten free Communion wafers, prefilled Communion cups with wafer, prefilled Communion cups without wafer (juice only) and prefilled white grape juice Communion cups with wafers. 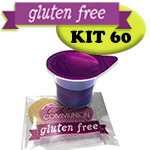 Don't miss Celebrate Communion's exclusive products, portable travel cases and gluten free Communion kits.